Now some details. This info is found in The Baby Whisperer Solves All Your Problems on page 59-60. Eating is similar to angel babies, who are generally good eaters and open to trying something new. Spirited babies can sometimes be impatient nursers if mom’s let-down is slow. “High energy, feisty, and very active.” These children are willing to jump in to activities and have little impulse control. They can be aggressive with other children and do better playing with others in morning hours. Hate being swaddled. Resistant to nap and bedtime–they don’t like to miss out on action. Impatient, opinionated, vocal, and stubborn (sounds like a toddler right?). They can be happy one moment, furious the next, and happy again. They love action but don’t monitor themselves and easily overdo it. Tantrums are hard to stop. Transitions are hard for these children. “A handful. Always into something. I don’t have the energy to keep up with her. She’s fearless.” (seriously sounds like a typical two year old to me). 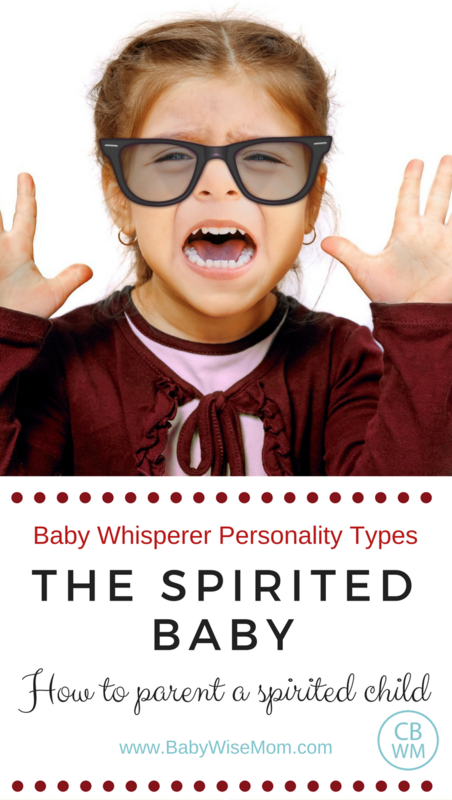 Do you have a spirited baby? Any tips for other moms with spirited babies? Previous Post Poll Results: DO YOU READ STORIES AS PART OF THE BEDTIME ROUTINE? I'm pretty sure that's my daughter! She's 6 months old now and has always hated being swaddled, but now, she seems to want to be swaddled in order to go to sleep. Her latest thing is ripping an arm out of the swaddle and grinning w/ twinkling eyes at me! My 3 year old is spirited and we've been working with his teachers and early intervention to help with more positive discipline and working w him and not against him. Since we did BW since he was born, he's an amazing sleeper, which is rare for a spirited child. So grateful we followed a routine cause we all need sleep w how busy this boy is. He does push our buttons but he's so sweet and senative. Thankfully there's support out there cause having a spirited child can be lonely, no one really understands what we go through daily. Thanks for you sharing too Michelle. This is my son to the T! He is only 4 months old… But he is as spirited as it gets. As far as activities, the crazier the better. He will jump in his jumper all day long and gets cranky if he sits still for very long. He hates dirty diapers, hates being confined in the car, and absolutely loathes naps. Transitioning from wake Tims to nap time requires at least 10 mins of crying while I hold him and rock him. On the other hand when he is where he wants to be (awake and center of attention) he is the happiest, smiliest little boy I have ever seen. He has such an infectious personality and is very social. People comment all the time how reactive and happy he is. Little do they know what goes on in the car and at nap time ;). I love how happy he is and how playful he is, I just wish nap time and car rides would get better, he needs naps and I need to get out of the house once in a while! My daughter is only 12 weeks old, but this describes her to a T. We have called her a "diva" from day 1! She knows what she wants and knows how to get it! Glad to know she's not alone 🙂 Does the baby whisperer discuss suggestions on how to handle the harder issues with this personality type? Like tantrums and resisting naptimes? There is talk on eating and sleeping based on personality profiles. She has a toddler book that I haven't read. I would bet she talks about tantrums in light of personality profiles. About six months ago, we discussed the Angel baby as described by Tracy Hogg in The Baby Whisperer Solves All Your Problems. Of my children, Kaitlyn is undeniably Angel. Some of you wondered about McKenna with the last post and I have friends question that isn’t she an angel, too? She is such a good sleeper and eater…yes–but I think she is textbook rather than angel. We will discuss that in this post. She has some very angelic qualities to her, but I would attribute that to her being a textbook baby who swayed angel with Babywise principles. Brayden is also a swayer. At his core, he is mostly spirited, but displays mostly textbook when Babywise principles are applied. We will discuss him here often as well as McKenna. So let’s talk textbook. A textbook baby is a baby who pretty much does everything “by the book”–their fine motor and gross motor skills are reached when “they” say they will be. They have their typical stormy times of life as “they” say they will and the easy times of life promised in books. Textbook babies are found on pages 58-59 in Baby Whisperer Solves All Your Problems. Similar to Angel babies (Generally good eaters as babies and open to trying something new. ), though Hogg says solids might need to be introduced more slowly. McKenna definitely fits the Angel baby description of eaters. She has always been a good eater and is always eager to try new foods. Brayden has been more of the textbook description of eaters. He is a good eater. He is usually willing to try new foods, though sometimes hesitant. As a baby, he had no reservations about new foods. Today, he will always try a new food, but he is often nervous about it. He has noticed, however, that he often really likes the new food, so he is willing to try new things. Moderately Active. Since they do everything on time, it is easy to chooose appropriate-level toys. Some are real doers; others hang back a bit. As a baby and pre-toddler, this definitely fit McKenna exactly. She was a baby my friends envied because she would sit on my lap when we were out and about and was content just to sit with me. As a toddler, however, she is quite active–but she is also a toddler. Toddlers are usually active. Brayden has always fit spirited description of activities more. Need the full 20 minutes (typical length of time to fall asleep) to fall asleep. If overstimulated, they might need more calming from a parent to settle. McKenna did sometimes take 20 minutes to fall asleep (which I only know thanks to a video monitor), but her typical was about 5 minutes. If I got the timing right, it was fast. Brayden fell asleep easily unless overstimulated (that is, once we started following Babywise). Similar to angel babies. They are low-reactors. They go with the flow so long as their signs of hunger, tiredness, etc. are met. Yes, McKenna was very chill. Hard to rattle. Brayden was this way so long as there was no hunger and no overstimulation, but if there was either of those things, he was more spirited. Right on time with everything. She is mellow unless she needs something. Low-maintenance. You can see that textbook and angel really are very similar. Many of the descriptions say “similar to angel babies.” So what is the difference? With an angel baby, you basically can’t go wrong. Your baby isn’t going to be good and easy pretty much no matter what you do. Even with reflux, Kaitlyn was without question angel. A textbook baby will often act like an angel if you meet all of her needs, which is so easy to do on the Babywise or Baby Whisperer routine. So they are easy. They are also very predictable–they are stereotypical in their milestones. With McKenna, she met her wonder week milestones. For example, when it was the 19 week wonder week (the worst typically), she had a random two week bad period (bad for her). Kaitlyn never really had that. Brayden was textbook so long as I kept him on track. If we deviated from our normal, he really had a hard time. So with all things right, he was a textbook baby in his demeanor, but was easy to shift off of that track with disruptions. The girls were both easy when disruptions came along.